As your dental provider, we're always alert for signs of tooth decay or periodontal (gum) disease, the two leading causes of tooth loss. But we're also watching for less common conditions that could be just as devastating. 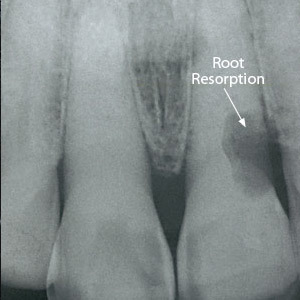 Root resorption falls into this latter category: it occurs when a tooth's root structure begins to break down and dissolve (or resorb). It's a normal process in primary ("baby") teeth to allow them to loosen and give way when permanent teeth are ready to erupt. It's not normal, though, for permanent teeth. Something internally or—more commonly—externally causes the root structure to break down. External resorption usually occurs at the neck-like or cervical area of a tooth around the gum line. Known as external cervical resorption (ECR), it can first appear as small, pinkish spots on the enamel. These spots contain abnormal cells that cause the actual damage to the root. 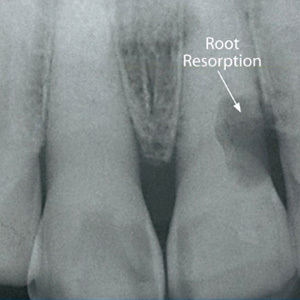 We don't fully understand how root resorption occurs, but we have identified certain factors that favor its development. For example, it may develop if a person has experienced too much force against the teeth during orthodontic treatment. Injury to the periodontal ligaments, teeth-grinding habits or some dental procedures like internal bleaching may also contribute to later root resorption. Early diagnosis is a major part of effective treatment for root resorption. Because it's usually painless and easily overlooked, resorption is often too difficult to detect in its early stages without x-rays—a good reason for regular dental exams. Beginning spots or lesions are usually small enough to surgically remove the tissue cells causing the damage and then filled with a tooth-colored filling material. If it has advanced further, we may also need to perform a root canal treatment. At some point, the damage from root resorption can be too great, in which case it might be best to remove the tooth and replace it with a dental implant or similar restoration. That's why catching root resorption early through regular dental exams can give you the edge for saving your tooth. As a new permanent tooth develops, the roots undergo a process of breakdown and growth. As older cells dissolve (a process called resorption), they’re replaced by newer cells laid down (deposition) as the jaw develops. Once the jaw development ends in early adulthood, root resorption normally stops. It’s a concern, then, if it continues. Abnormal root resorption most often begins outside of the tooth and works its way in, beginning usually around the neck-like (or cervical) region of the tooth. Also known as external cervical resorption (ECR), the condition usually shows first as pink spots where the enamel is being undermined. As these spots continue to erode, they develop into cavity-like areas. While its causes haven’t been fully confirmed, ECR has been linked to excessive pressure on teeth during orthodontic treatment, periodontal ligament trauma, teeth-grinding or other excessive force habits, and bleaching techniques performed inside a tooth. Fortunately, ECR is a rare occurrence, and most people who’ve had these problems won’t experience it. When it does occur, though, it must be treated as quickly as possible because the damage can progress swiftly. Treatment depends on the size and location of the resorption: a small site can often be treated by surgically accessing the tooth through the gum tissue and removing the offending tissue cells. This is often followed with tooth-colored dental material that’s bonded to the tooth to replace lost structure. A root canal treatment may be necessary if the damage has extended to the pulp, the tooth’s interior. However, there’s a point where the resorption becomes too extensive to save the tooth. In these cases, it may be necessary to remove the tooth and replace it with a dental implant or similar tooth restoration. In its early stages, ECR may be difficult to detect, and even in cases where it’s been diagnosed more advanced diagnostics like a CBCT scanner may be needed to gauge the extent of damage. In any case, it’s important that you have your teeth examined on a regular basis, at least twice a year. In the rare chance you’ve developed ECR, the quicker it’s found and treatment begun, the better your chances of preserving the tooth. If you would like more information on root resorption, please contact us or schedule an appointment for a consultation. Tooth decay and periodontal (gum) disease pose the most common dangers to dental health. But there are some rare conditions that can also place teeth at risk to be on the lookout for during regular dental checkups. One such condition is root resorption in an adult tooth, in which the root itself or its surface breaks down and is absorbed by the body. Resorption occurs naturally in a primary (“baby”) tooth so it can loosen and give way for an incoming permanent tooth. Â Resorption still occurs in a limited form with young permanent teeth but should eventually stop. Sometimes, though, it doesn’t, either from the inside of the tooth out (internal resorption) or more often from the outside in, usually around the neck-like (or “cervical”) portion of the tooth. This more common occurrence, External Cervical Resorption (ECR), can first appear as pink spots on the enamel and then progress into cavity-like areas. If not found and treated promptly, damage can occur quickly and lead to tooth loss. We don’t fully understand the exact nature and causes for ECR, but we have identified risk factors for its development. Excessive orthodontic force on the teeth or any other trauma can cause damage to the periodontal ligament (which holds teeth in place with the jaw bone). Teeth grinding habits and some dental procedures like internal tooth whitening can also be risk factors.That being said, though, the vast majority of people who experience these issues don’t develop ECR. Although the causes aren’t fully understood, we can still treat it: the key to success is early detection. You probably won’t notice early signs of ECR, but we can often detect spots from routine x-rays. We can then remove the tissue cells within the lesions causing the damage and restore the area with a tooth-colored filling material. If ECR has extended near the tooth’s interior pulp layer, then a root canal treatment may be needed. Needless to say, the more extensive ECR occurs in the roots, the less likely the tooth can be saved and may need to be extracted. It’s important, therefore, to maintain regular dental checkups (at least twice a year) to increase your chances of catching a developing problem early. Baby (primary) teeth look and function much like their permanent counterparts. Besides having a visible crown, they also have roots that maintain contact with the jawbone. But there are some differences, the biggest one being the normal process whereby primary tooth roots dissolve or, in dental terms, resorb. Root resorption eventually leads to the tooth coming loose to make way for the permanent tooth. Adult tooth roots can also resorb — but it's decidedly not normal. If adult root resorption isn't promptly treated, it could also lead to tooth loss — but there won't be an incoming tooth to take its place. 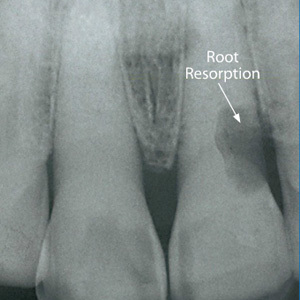 Although it can begin inside a tooth, adult root resorption usually begins on the outside. One type, external cervical resorption (ECR), begins around the neck-like area of the tooth not far below the gum line. Its initial signs are small pink spots where the tooth enamel has eroded; those pink cells within the space are doing the damage. We don't fully understand the mechanism behind ECR, but there are some factors that often contribute. People with periodontal ligament damage or trauma, sometimes due to too much force applied during orthodontic treatment, have a high risk of ECR. Some bleaching techniques for staining inside a tooth may also be a factor. The key to treating ECR is to detect it as early as possible before it does too much root damage. Regular checkups with x-rays play a pivotal role in early detection. Advanced stages of ECR might require more advanced diagnostics like a cone beam computed tomography (CBCT) scan to fully assess the damage. If the lesion is small, we can surgically remove the cells causing the damage and fill the site with a tooth-colored filling. If ECR has spread toward the pulp, the tooth's inner nerve center, we may also need to perform a root canal treatment. Either of these methods intends to save the tooth, but there is a point where the damage is too great and it's best to remove the tooth and replace it with a life-like dental implant or other restoration. That's why it requires vigilance through regular, semi-annual dental visits to detect the early signs of root resorption before it's too late.